Oh hi . . . pardon me . . . I used to blog here? Thanks for saving my spot! Now that classes are over, finals are taken, papers submitted, course evaluations returned, the Seminary shut down, my final class enrolled in anyway, and a 2015 graduation applied for, maybe I will be able to return here time and again to keep this little site alive. I seem to remember remembering stuff on Mondays (we’re way ahead of Throwback Thursday here at the Jenn Stories), so here’s a memory–kind of. Just before I was diagnosed with breast cancer in October of 2008, I went to a Garlic and Arts Festival in western Massachusetts, where I bought a head of garlic, the cloves of which to plant in the garden. I think I planted it shortly after my surgery–just long enough after for me to be able to get out and about. You can imagine that by the time I got around to planting it, I was rather preoccupied with other things, so I didn’t really take care to do it properly and was kind of surprised in the spring that anything came up from it at all. Only . . . it wasn’t much. 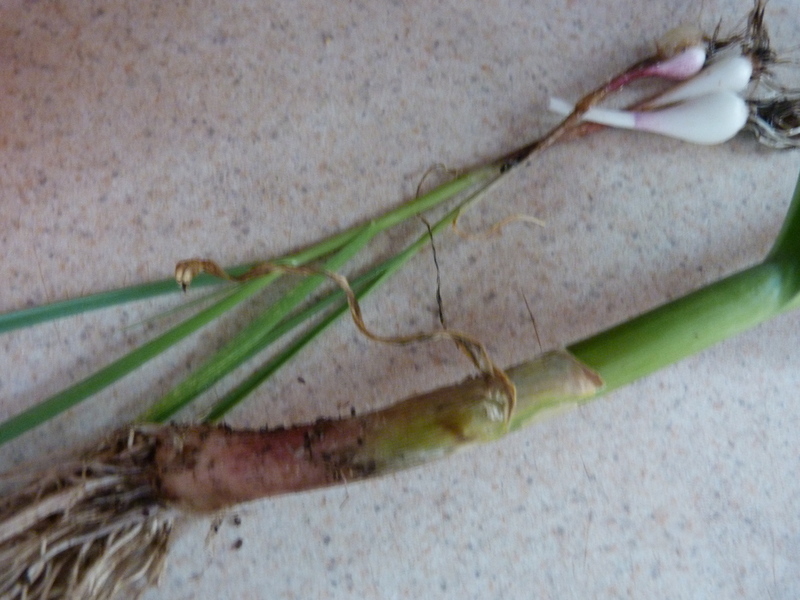 I never harvested it because it never really seemed to grow past a certain point, and I began to call it Confused Garlic, because over the next few years it would disappear in the spring and sprout again just before the snow came . . . but it never quite died, either. When I got married, I dug it up and transferred it here, just to see what would happen. What happened was, it continued to do its quirky garlicky thing. I replanted it in a different bed once, and it is still refusing to thrive, but also refusing to die. 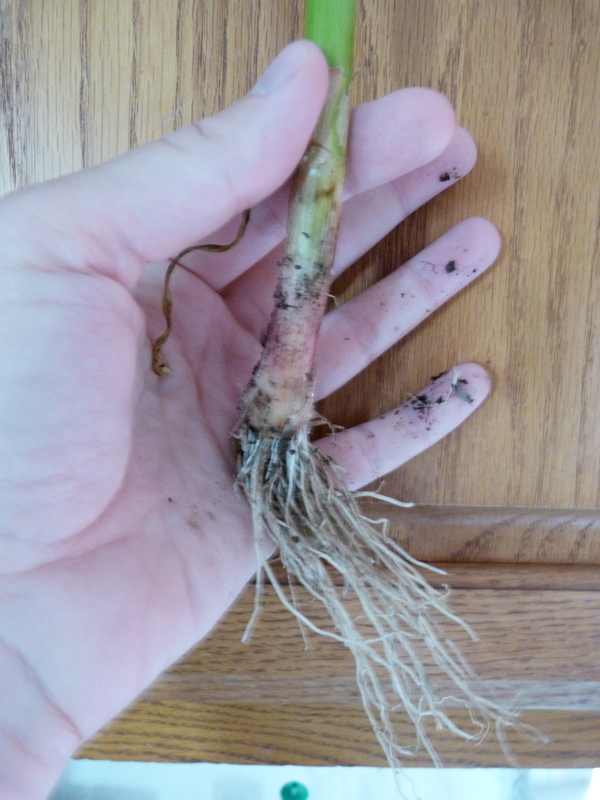 This fact might be made more remarkable by the fact that bulbs do not do well in our soil at the best of times (this fact would make another blogpost in itself). So we went to visit the BroFam last week and the garlic-seller at the festival had said that garlic should be harvested in June, and hey! We came back and it was June! 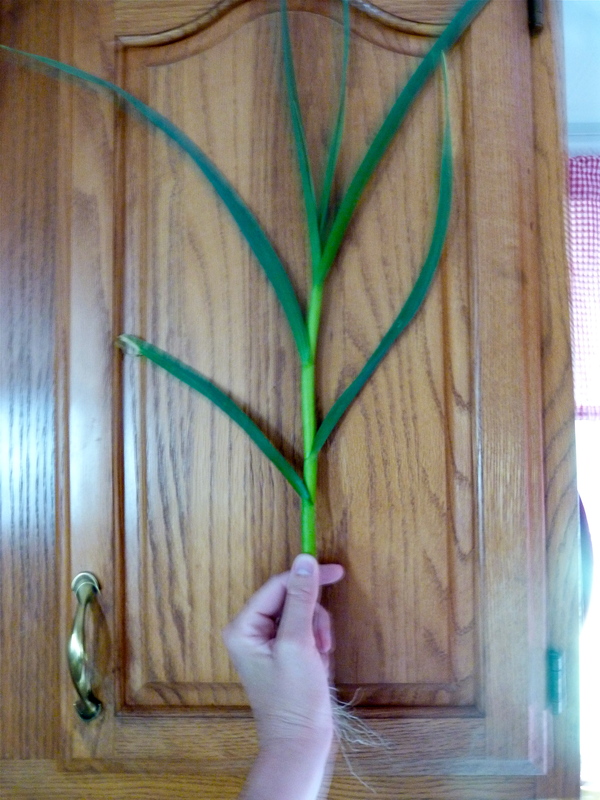 So yesterday I chose a “tester” plant to harvest. It was actually one of the runtier ones, comparatively, and yet look. It extends beyond the top of the cabinet! So it was a little deflating when the yield of this beauteous plant was discovered to be . . . 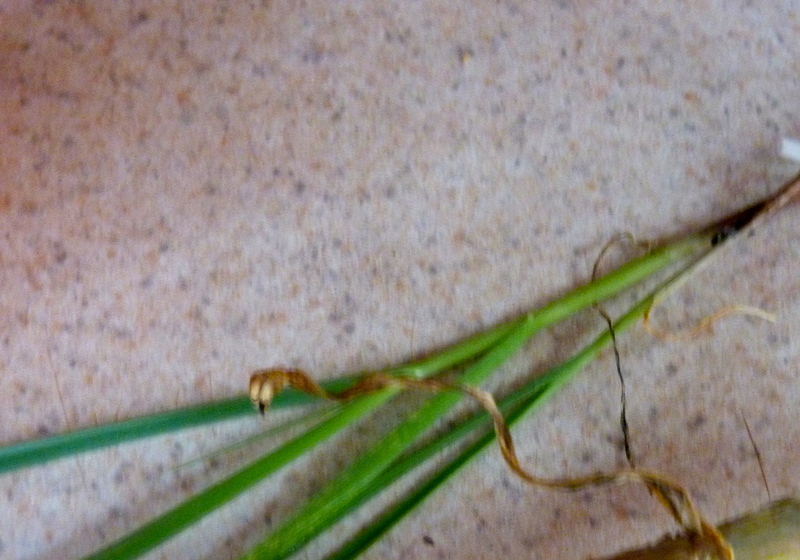 Suddenly, even the Confused Garlic looks more like garlic than that. I mean, you know, relatively speaking. I am happy you are back. I so thought the garlic was going to be a metaphor for your blog. Does this mean no more theology blogs for the summer? Oh there will still be theology posts. That bit of my brain/personality doesn’t just shut off, you know. thank you for writing again – I do enjoy your points of view! 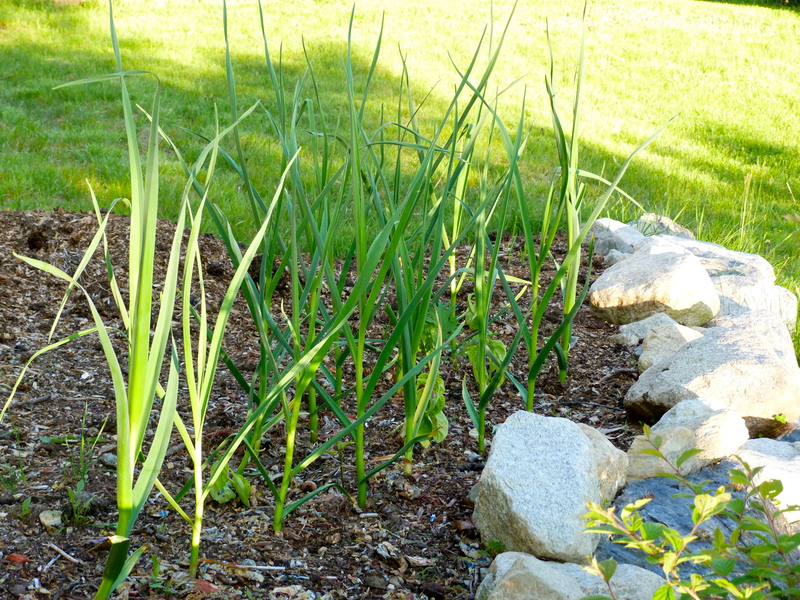 This post has me wondering if I can try to plant some garlic of my own. Do you need special “sets” or can you just huck a clove into the soil? This story sounds remarkably similar to my attempting grow onions story…although I didn’t go to the onion festival to procure my seed onions I did end up with inevitably similar results. Alas. Yeah, we can’t grow onions either. It just seems like Garlic Festival garlic should have magical growing properties. You know? Perhaps the “Whovians” could make these things grow? Nice to see you in print, eh pixel! Looking forward to more posts! You and your garlic are adorable. Good to hear from you. Isn’t good to know we are still here rooting you on! Also–yes. It IS good to know. Thank you!